A parliamentary subcommittee once again failed to reach an agreement on allowing nonfinancial firms to take bigger stakes in Internet-only banks Monday, hampering the government’s bid to promote innovation in the financial sector. Lawmakers at the National Policy Committee reviewed bills on easing the ownership limit for Internet banks of 4 percent for nonfinancial firms, but they differed on the scope of the cap and how to define nonfinancial firms subject to the envisioned deregulation, following their previous meeting last week. 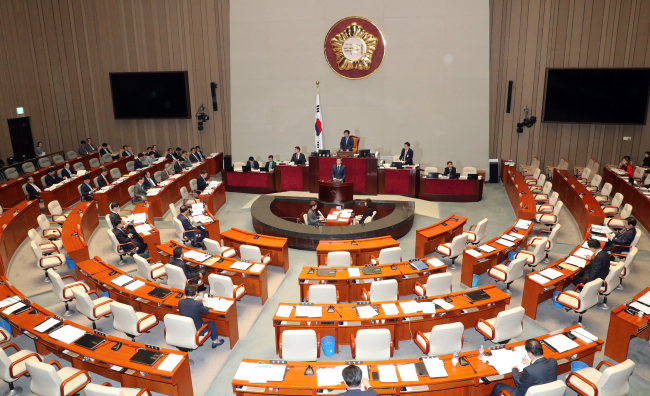 The ruling Democratic Party of Korea wants the enactment of a special law that calls for boosting the ownership cap in web-only banks to 25-34 percent. But the main opposition Liberty Korea Party proposed a revised bill to boost the ceiling to 50 percent. The current restriction on bank ownership is aimed at preventing family-owned conglomerates from gaining control of lenders on concerns that they could easily get credit for their expansions. Two Internet-only banks -- K-Bank and Kakao Bank -- were launched last year, but they have faced difficulty growing sustainably as their two biggest shareholders, KT and Kakao, are unable to issue shares for the banks’ capital increase. The DP and the Financial Services Commission, the financial regulator, proposed that conglomerates with more than 10 trillion won ($9 billion) in assets will not be allowed to take more stakes in web-only banks beyond the ceiling. But an exception will be applied only to those whose aggregate assets on information and communication technology account for more than half of their nonfinancial assets, they said. Opposition parties claimed that the meaning of ICT-focused firms is arbitrary as they are defined by the industrial categorization by the statistical office. Some DP lawmakers still oppose deregulation on Internet-only banks as the move could prompt conglomerates to use a bank as their private vault. Apparently mindful of such criticism, the National Assembly is studying ways to restrict Internet-only banks from extending loans to conglomerates, according to parliamentary and financial sources.